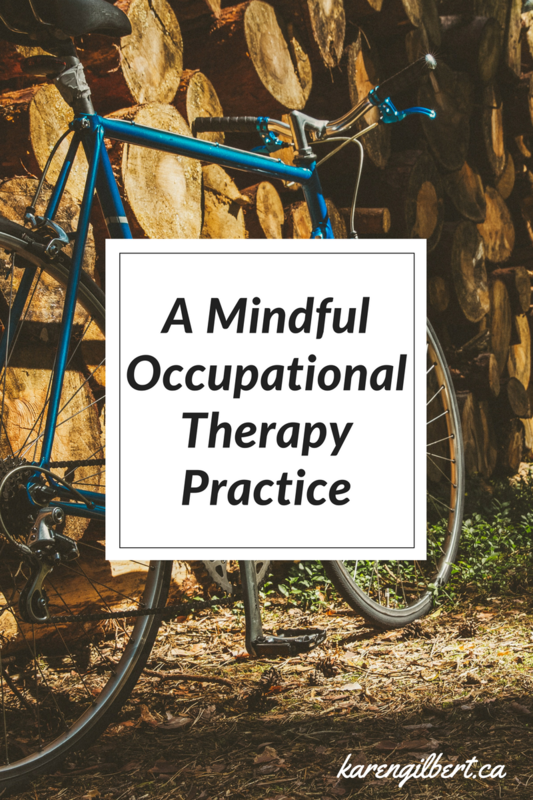 Our next OT incorporates mindfulness meditation for chronic pain and mental health into her OT practice. 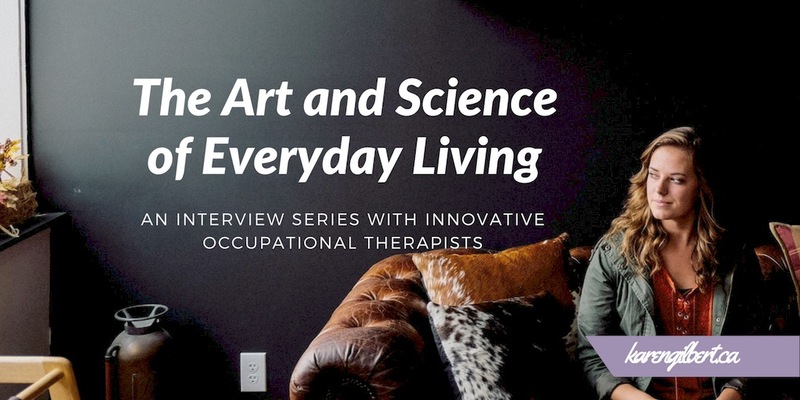 If you have an invisible health condition like chronic pain, depression or anxiety, you may find pieces of your own story reflected in the words of the occupational therapists interviewed in this series. You may even find a tip or two to help you live your life with more ease, joy and meaning and foster a renewed sense of hope. 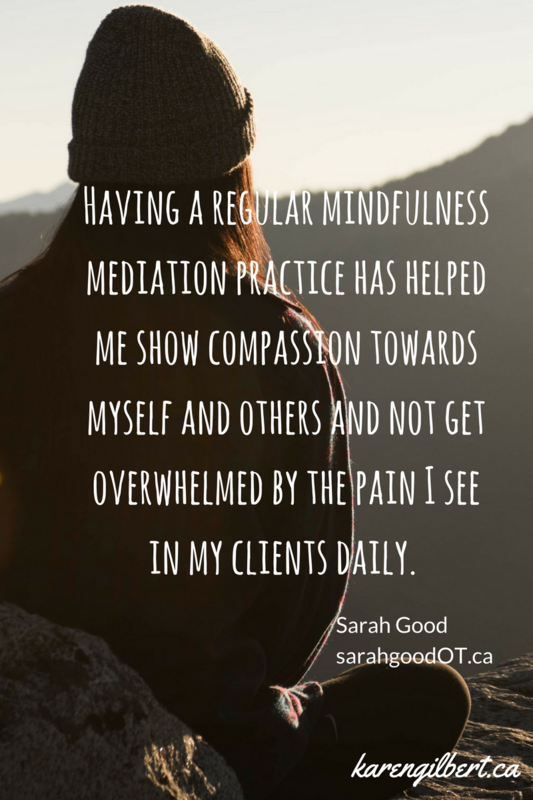 Sarah Good is a community based occupational therapist, case manager and mindfulness meditation teacher. She uses a client centered, recovery oriented approach to psychosocial rehabilitation, often incorporating mindfulness-based interventions into her occupational therapy practice. 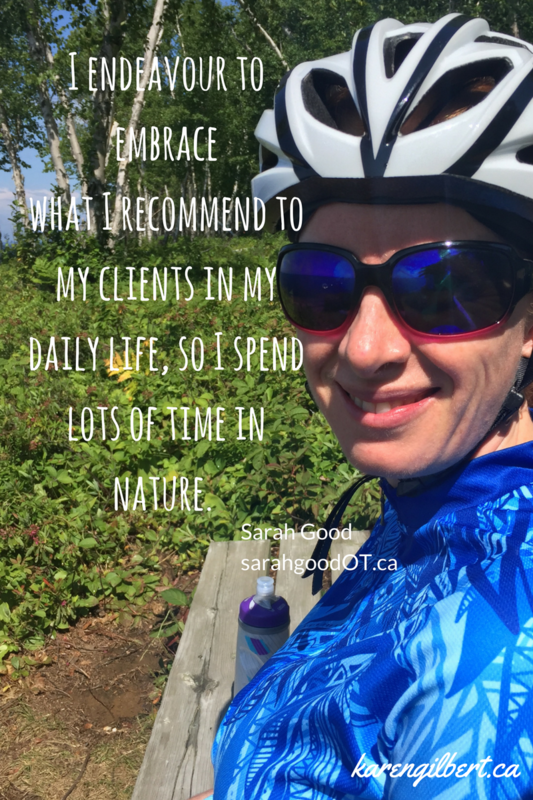 In order to build a more environmentally sustainable practice and minimize travel costs, Sarah focuses on downtown Ottawa and sees many of her clients on foot or by bicycle. 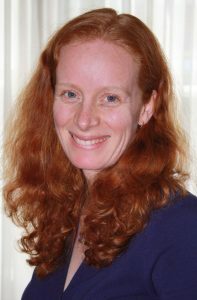 Sarah is currently the Topic Editor for the Private Practice column in Occupational Therapy Now (published by the Canadian Association of Occupational Therapists). I discovered that Sarah and I had a shared interest in supporting people with invisible or chronic health conditions to manage the stresses of life on find-an-ot.ca. I was excited to learn that she also had a wealth of experience in mindfulness and shared interests in occupational therapy approaches for sleep, mental health and chronic pain. I am delighted that she is here to share her knowledge and perspective with us. I describe my role to clients as a person who can help them get back to what they need to do or want to do. I explain that I can help them build healthy routines and develop adaptive coping skills. My clients are usually facing a variety of struggles, often a combination of chronic pain and mental health challenges. Common struggles include sleeping, handling stress, managing a household and completing paperwork. Frequently, my clients are experiencing social isolation, lack a routine, are overwhelmed or are not managing self-maintenance activities (such as exercise, healthy eating, medical follow-ups). 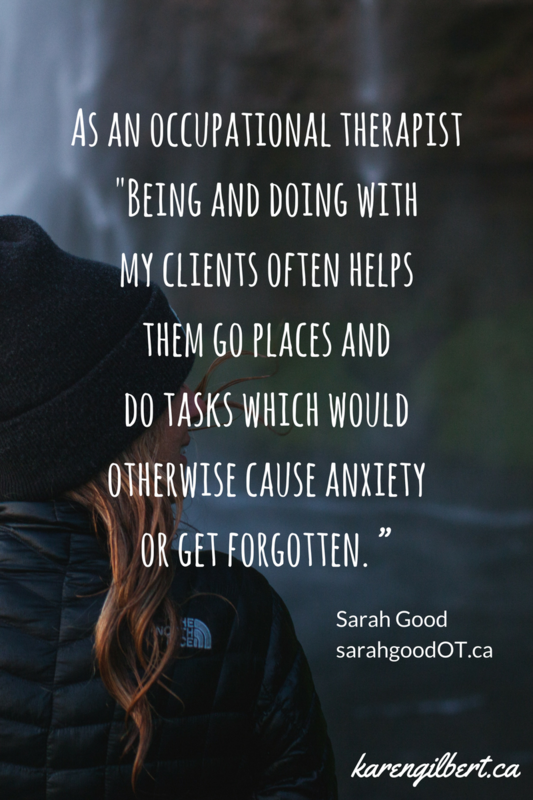 As an OT, I can meet clients where they are (often their homes or workplace). Once I have established a rapport in a place where they feel safe, I can go with them to new places (such a library, nature path or yoga class). Clients also appreciate that we can get tasks done during the appointments (such as returning phone calls, sorting papers or doing a household task). Being and doing with my clients often helps them go places and do tasks which would otherwise cause anxiety or get forgotten. The benefits of contemplative practices such as mindfulness meditation and yoga, and the benefits of time in nature. I had a personal mindfulness meditation practice for several years and noticed the benefits personally. In about 2010, I became very impressed with the research into the benefits of mindfulness meditation for people with mental health issues and pain management. I have wanted to be an occupational therapist since I learned about the profession as a teenager. It fits with who I am and how I live my life. As such, I feel that I can weave my learning as an OT into my own life naturally. I developed a regular mindfulness meditation practice shortly after graduating as an occupational therapist. 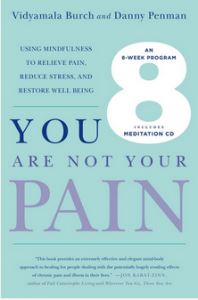 Having this practice has helped me to show compassion towards myself and others and not get overwhelmed by the pain I see in my clients daily. I believe that this practice has also helped me handle other areas of my life more skilfully, such as parenting and handling everyday challenges. I endeavour to embrace what I recommend to my clients in my daily life. As such, I spend lots of time in nature. I have developed a practice that allows me to walk or bike to many of my client’s homes. I have learnt much about human resilience from my clients and gained an appreciation of the fragility of life. Being a mother and a partner are huge roles in my life. The occupations involved in raising children have greatly shaped who I am and bring meaning to my life. However, I also need occupations that restore me. Reading, meditation, journal writing, time with friends and outdoor activities restore me. “Every stage passes”… This can be hard to believe when in a particularly encompassing stage of life. However, the difficult parts of our lives and the wonderful parts do pass. The challenge is to appreciate the wonderful parts even when there is also difficulty. Respect your limits. Show yourself some loving-kindness by speaking to yourself as you would speak to a friend going through your health condition or life transition. Sarah teaches Mindfulness-Based Symptom Management (Pain and Chronic Illness Management) at the Ottawa Mindfulness Clinic. Her next course will be offered in September 2017. It will run on Wednesday mornings from 10-12 for eight weeks beginning September 13, 2017. For more information and details on upcoming courses, visit the Ottawa Mindfulness Clinic.